Highlights: Italy small group tours to Rome, Florence and Venice. Join one of our exclusive, upscale escorted small group tours of Italy’s most important cities – Rome, Florence and Venice. On this classic tour of Italy we will travel a trio of cities filled with historic, artistic and architectural treasures everyone should see in their lifetime. Your small group tour of Italy begins in Rome, where you will see the ancient wonders that have drawn visitors to this capital for centuries: the Colosseum, St. Peter’s Basilica, the Vatican, the Sistine Chapel and more. This escorted Italy tour will also take you to Italy’s Renaissance city – Florence. 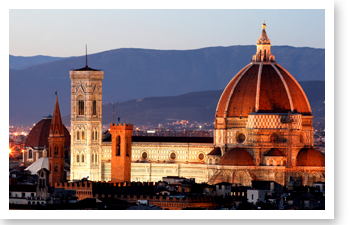 The architecturally stunning city of Florence, famous gold, leather and other artisanal products, also awaits you on this tour. The last stop of your small group tour of Italy is the elegant “floating” city of Venice, a relaxing way to end this fantastic “best of Italy” tour. Join us on our small group tour to Tuscany, Italy. This upscale tour includes sightseeing through the countryside of Tuscany while experiencing the fantastic food and wine it offers. 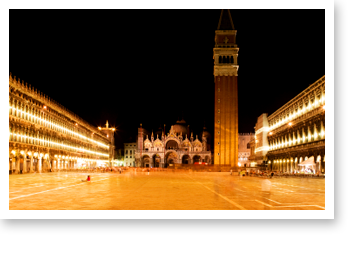 Guided tour of Venice’s art and architecture treasures: St. Mark’s Square and Cathedral in Venice, Doge’s Palace and more. Possible Excursion opportunity to Lucca. 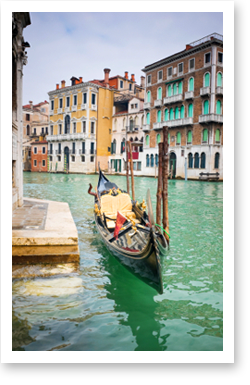 Airport transfers in Venice. Water taxi is suggested. 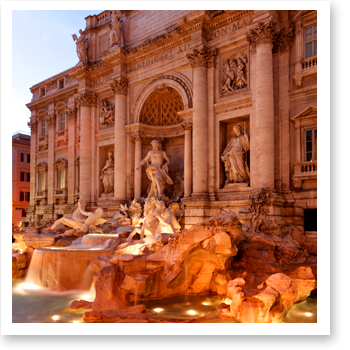 This fabulous escorted Italy tour starts in Rome, your home for the next three nights. You will be picked up at the airport upon arrival. Our driver will be right outside customs waiting for you. Rest, freshen up and meet everyone in the hotel lobby at 5pm. You will meet the group and we’ll start our tour of Rome with a stroll and acquaint you with your new surroundings. If you are ready to explore Rome earlier, just give us a call on our cell phone and we will come meet you. Meet everyone in the hotel lobby at 9:30am today. This morning, an excellent Rome licensed tour guide will take you on a walking tour of Ancient Rome and see some of the finest feats of Roman architectural engineering. Hear about fascinating stories about the Colosseum, which stands near the center of present-day Rome. You will tour the Forum, once the administration, business and commercial center of Ancient Rome, and see its numerous temples, Basilicas, arches and more. Other sites we will visit include the Arch of Constantine and Piazza del Campidoglio, designed by Michelangelo. We will also take you to the Pantheon, Italy’s best-preserved dome and the biggest in Europe until the Renaissance. We’ll have lunch together at one of Rome’s fantastic restaurants. Note: Modest dress to enter the cathedral, as in all churches in Italy. Shoulders and knees must be covered. No shorts, please. We will meet our licensed Rome tour guide for our tour of the Vatican today. You are in for a treat as one of our expert licensed tour guide in Rome will take you on a guided tour of the Vatican. In your tour of the Vatican, you will discover a treasure trove of art, history and religion today. 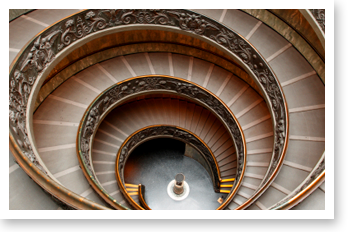 The Vatican Museum’s art collection, which our tour group will visit, is one the most important in the world. You will also see the recently restored Sistine Chapel, home to Michelangelo’s Last Judgment frescoes; and tour St. Peter’s Basilica and view Michelangelo’s famous Pieta, Bernini’s amazing bronze Baldacchino, and the Popes’ tombs. Today, we will take a train to Florence, where we will stay for the next 2 nights. At 10am, our fantastic tour guide in Florence will come lead us on a three-hour guided walking tour of Florence. NOTE: Optional guided tour of the Uffizi Gallery in Florence is available. Please inform us ahead of time so we can make a reservation for you. You may also visit the Uffizi on your own. Either way, reservations are necessary. Please let us know what you would like to do. Today, you’re free to explore the endless sights of Florence on your own. Florence has many more museums, palaces, shops and open markets than we will have time to show you, so this is the time to explore what interests you most. The Uffizi Museum is a must-visit for art aficionados. You can also visit the Boboli Gardens – a 16th-century sculpture garden — or go shopping for Florence’s trademark leather and gold. Your tour manager is available to help you plan your day. Note: Modest dress to enter the cathedral as in all churches in Italy. Shoulders and knees must be covered. No shorts please. We’ll leave Florence early this morning and make our way to Venice via train, catching a private water taxi to our hotel. We expect to arrive mid-day. After check-in, you’re free to have lunch on your own at one of our many local favorites. Let us know if you want company. After lunch, our fabulous Venice tour guide will show you the most important sites of Venice, starting with a tour of St. Mark’s Square. We will also tour the Doge’s Palace, the ancient political and administrative center of the Republic of Venice; the famous Bridge of Sighs, so-called as it was the last view convicts saw before their imprisonment; St. Mark’s Church with its gold mosaics; the eclectic Rialto Market, which houses Venice’s oldest pub; and more. Having seen the key sites yesterday, you’re free to explore Venice on your own today. Today is the last day of your Italy tour so enjoy Venice thoroughly. Your tour manager is available to help you plan your day. We suggest you simply wander the different neighborhoods. You may want to view the brilliant contemporary art collection housed in the Peggy Guggenheim museum, which will show you another side of Venice. The Guggenheim mansion, which faces the Grand Canal, has a lovely garden and cafe. You may also choose to tour one of the other nearby islands, like Murano, famous for its glass blowing. It’s a short ride away on a public water bus. Speak to us for more details.